how to set the margins for richtextbox paragraphs. In the previous articles i explained basic WPF concepts like What is wpf and it's features, Wiindows Forms vs WPF Future, what is XAML and it's compilation process,WPF Architecture etc. Unlike other controls in wpf, richtextbox doesn't have content as property for setting content. Richtextbox has Document property to set or get the content or text. Here this Document is FlowDocument type. Here this FlowDocument may contain multiple paragraphs. As the Document Property of the RichTextBox is the FlowDocument type so we have create an object of type FlowDocument, and add paragraphs to Blocks property of FlowDocument and Finally assign this FlowDocument to Document Property of RichTextBox Control. To read text from RichTextBox FlowDocument type we have to use TextRange( ). While Adding text to richtextbox, we added paragraphs to Blocks property of FlowDocument type, so for clearing text we have to clear the Blocks of Document in the following two ways. 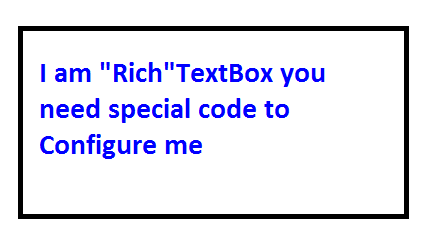 richTextBox1.Document.Blocks.Clear() ' OR richTextBox1.SelectAll() richTextBox1.Selection.Text = ""
While adding text using paragraphs we may get more space between para's in richtextbox so to set the margin between paragraphs use below code in resources section of XAML code. I hope you are clear about reading, adding ,clearing the text from richtextbox control. I hope you will see the WPF Tutorials section for More Tutorials and How to's . Don't forget to Comment and Share if you like this post for our friends. Thank You. Really nice and informative thanks for sharing this.